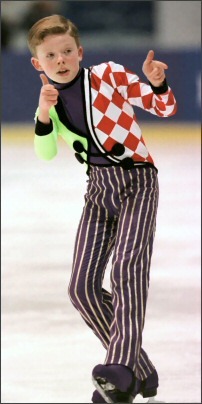 Thirteen-year-old Kevin Reynolds was a huge crowd favorite at the 2004 Canadian National Figure Skating Championships. Reynolds is in grade eight. He’s home schooled because that works better with his training time. “Math is my favorite,” he said. “And I have to read a lot for science.” But he’s not sure what he wants to do for a career. Reynolds, who plans to compete until the 2010 Olympics, also won two other novice events in 2003, the North American Challenge Skate in Edmonton and the Triglav Trophy. Next season, he hopes to get some Junior Grand Prix assignments and eventually become Canadian champion and go to Worlds.